A trip to Palenque , Chiapas is to delve into the heart of Mayan design. Where in Oaxaca, one sees strong Zapotecan and Mixtec elements in their crafts, Chiapas represents the distinctly Mayan traditions. Mayan traditions have contributed essential design ideas throughout the world, from jewelry designers, textile artists, painters to architects. A great example is Frank Lloyd Wright’s Ennis House in Los Angeles (1924) which reflects his deep admiration for Mayan architecture. When visiting Palenque, you are struck by the elements of architecture that continue to be used today: courtyards, square buildings, quadrangles, open space using platforms of various sizes and levels, and inclusion of landscape elements. As in the small river that was diverted around palaces at Palenque, and yet with wooden bridges, connects one area of Palenque with another. Color was most certainly part of this design, sadly we can only imagine now how those colors blended with the environment to create a unique, prototypical Mayan city. 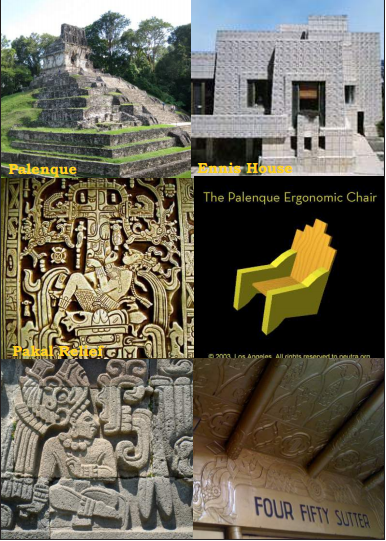 The reliefs depicting Pakal, the leader that had the most impact in the creation of Palenque at its height, even inspired an ergonomic chair, designed to fit your body at angles based on his position as depicted in the lid of his sarcophagus (with other design elements to inspire for all time). There is even room for a headdress, if necessary, to wear while seated. Art deco has many magnificent examples of Mayan design incorporated into buildings, one lovely example being 450 Sutter Street in San Francisco, with its ceiling inspired by the Mayan pyramids. Many design elements we see in Chiapas and Oaxaca can be seen in many buildings constructed today, especially in the resorts and city buildings throughout Mexico and Guatemala. Palenque is filled with beauty, and it is easy to understand how artisans and architects took design cues from the environment.